The UAE Ministry of Interior, MOI, and the University of Sharjah have signed a Memorandum of Understanding, MoU, to promote cooperation in a range of areas, especially in innovation, and implement the vision of the wise leadership in light of the UAE’s strategy, to achieve mutual benefits for both sides, Emirates News Agency WAM reported. 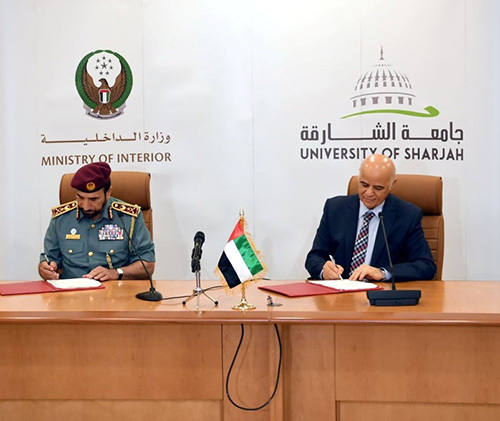 The MoU was signed by Lt. General Saif Abdullah Al Shafar, Under-Secretary of the Ministry of Interior, and Dr. Humaid Majoul Al Nuaimi, Director of the University of Sharjah. The MoU aims to promote cooperation between both sides and enable them to benefit from innovative ideas and exchange knowledge, experiences and practices, as well as to provide support through consultations. The MoU stipulates cooperation in organizing conferences and workshops to be held by the MOI, as well as in supporting talented and innovative people from the university and forming a joint committee to evaluate innovative projects presented by its students. The MoU also stipulates cooperation in organizing training related to innovation and implementing innovative projects, as well as providing university scholarships for innovative and excellent MOI employees, and enabling innovative students to assist in the ministry’s exhibitions. In his speech, Al Shafar stated that the MoU is part of the Ministry’s efforts, as per the directives of H.H. Lt. General Sheikh Saif bin Zayed Al Nahyan, Deputy Prime Minister and Minister of the Interior, to promote cooperation with academic institutions while adding that it will help to implement joint training projects in innovation and praising the university’s academic role as a centre of education and research in the UAE and the Gulf Cooperation Council, GCC. Al Nuaimi said that H.H. Dr. Sheikh Sultan bin Mohammed Al Qasimi, Supreme Council Member and Ruler of Sharjah and President of the university, has made the university a national development institution, which aims to serve and develop the local community through cooperating with national authorities and private companies.